Walking down Carrer Parlament in Barcelona’s Raval one day in June, I came across a place that brought back sweet memories of summers in that city. The neighborhood has become trendy, but Horchatería Sirvent is still there, righteously unhip. Sirvent is an old school place that holds firm to the Spanish belief that icy sweets are strictly warm weather treats. In high summer, the shop expands its hours, and crowds fill the neighborhood sidewalks, sipping peacefully until the store closes at 1:30 a.m.
One of the specialties at Sirvent is horchata de chufa, a nutty-milky drink made from ground tiger nuts. But my favorite is helado de leche merengada—literally “meringued milk." This dessert is part granita, flavored with a light zest of lemon rind and a warm dash of cinnamon, and part milk shake, made frothy with a quick meringue. 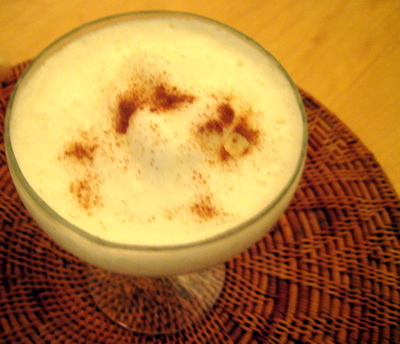 The traditional version is served in a tall narrow glass with a dash of cinnamon on top, a spoon, and a straw. There’s also a fabulous ice cream version on a cone. Neither leche merengada nor horchata are purely Catalan treats—they’re Valencian, from a little further down the Mediterranean coast. But Sirvent’s recipes have been Barcelona favorites for more than 80 years. Tomás Sirvent Planelles first opened his horchatería in the Barri Gótic in 1920. His son Tomás Sirvent Plá moved the operation to its current location in 1943, and now his sons Marc and Tomás Sirvent Juncos, grandsons of the founder, are learning the business, with plans to continue the family tradition. In the winter, the Sirvents close up shop and head to Valencia to tend to a related business: making turrons, Spain’s almond nougat candy. The Sirvent reputation rides on their dedication to excellent ingredients; they are picky about the tiger nuts, marcona almonds, and rosemary honey that go into their artisanal versions of the traditional winter sweet. Most everything they use comes from Xixona, their hometown and Spain’s turron capital. What the fresh flavors here confirm is that this is no chain operation. Sirvent is a worthy destination on a walk into a less tourist-clogged corner of downtown Barcelona. It is at the edge of the Raval, the neighborhood to the right of the Ramblas as you face the sea, in what was always a working class district, dotted with some medieval treasures and worried by a few rough spots. Lately it’s been discovered by the arty—the Museu d’Art Contemporani de Barcelona (MACBA) is here. Fashionable shops and the halal markets of North African immigrants are interspersed with vestiges of the old neighborhood. The location also borders Poble Sec, where a walk seaward along the Ronda Sant Pau and on down the Paral-lel takes you to the Drassanes Reials, the medieval shipyards, and a remarkable intact section of the city’s 14th century walls. “Our neighborhood? Sant Antoni, of course,” says Marc, reminding me that since the store sits just outside the old city walls it is officially part of the Eixample. While tourists flock to Gaudí’s houses in the swanky middle of the district, this left-hand side is defined by another moderniste delight, perhaps equally interesting to food lovers: the Mercat de Sant Antoni. Designed by Rovira y Trias and finished in 1882, this beautiful ironwork market is actually bigger than the famous Boquería—and, with nary a tourist roaming the stalls, maybe better. Horchatería Torronería Sirvent, Carrer Parlament, 56; open 7 days, hours and products vary by season: April-November, cold treats until 1:30am; November-January, turrons until 9pm. Closed February and March. Telephone: 93-441-27-20. For the milk base: Pour the milk into a saucepan and add one cup of sugar, the cinnamon stick, vanilla bean, and lemon rind. Bring the mixture to a boil, stirring occasionally, and then lower the heat to simmer for three minutes. Remove from heat to cool, and pour the milk through a fine strainer into a wide, shallow metal bowl or baking dish (you want the base to be only about one inch deep so it will freeze easily). Discard the rind and cinnamon stick and scrape the soft inner flesh of the vanilla bean into the milk before discarding the pod. Refrigerate overnight or all day until well chilled. Freeze, fluff, and finish: About an hour before you plan to serve it, place the milk mixture in the freezer. After about a half hour it should begin to set up. Stir it well with a fork and put it back in the freezer for another 15 minutes. I had this at a wedding in Spain and I loved it! I'm so glad you posted this recipe...I will certainly try it!